Almighty and everlasting God, we thank you for your Servant Channing, whom you called to preach the Gospel to the peoples of Asia. Raise up, we pray, in this and every land heralds and evangelists of your kingdom, that your Church may proclaim the unsearchable riches of our Saviour Jesus Christ; who lives and reigns with you and the Holy Spirit, one God, now and for ever. 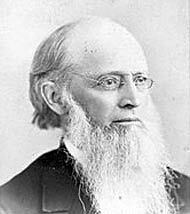 Williams was born in Richmond, Virginia, in 1829, and ordained deacon in 1855. The Episcopal Church sent him to China, where he was ordained priest in 1857. In 1859 he was sent to Nagasaki, Japan, and in 1866 was consecrated Bishop of China and Japan. In 1868 Japan was opened to far greater contact with the West than before, and he determined that he could achieve best results by concentrating his efforts on Japan. In 1874 (or is that 1877?) a new bishop (Samuel Isaac Joseph Schereschewski, see October 15) was consecrated for China, and Williams went to Tokyo (then called Edo or Yedo), where he founded what is now St Paul's University. In 1878 he helped unite several mission efforts in the formation of the Nippon Sei Ko Kai, the Holy Catholic Church in Japan. In 1889 his health began to fail, and he asked to be relieved. In 1893 a successor was appointed, and Williams stayed on, living in Kyoto and helping to open new mission stations. He returned to America in 1908 and died 2 December 1910.